LUBBOCK, Texas (April 23)--On the heels of a whirlwind weekend at the Southern New Mexico Speedway, the USMTS caravan has exited the Chihuahuan Desert and "City of Crosses" and heads into the Lone Star State for another highly-anticipated tripleheader this Friday, Saturday and Sunday, April 27-29. 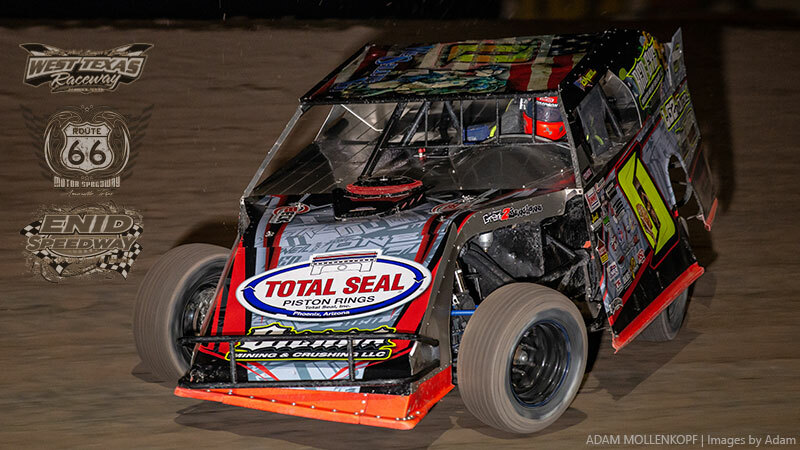 Action gets underway on Thursday as the West Texas Raceway in Lubbock, Texas, welcomes back the mud-slinging modified masters for a second straight year. 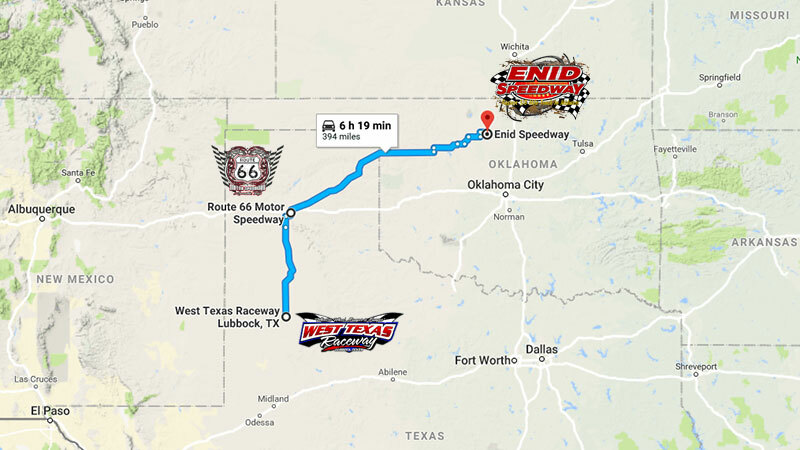 Then on Saturday, the series hits the road and heads to the Route 66 Motor Speedway in Amarillo, Texas, before wrapping up with a Sunday drive to the Enid Speedway in Enid, Okla.
All three shows will be championship points races featuring the Best of the Best in both the USMTS Hunt for the Casey's Cup and the Summit USMTS Southern Series. In the USMTS Hunt for the Casey's Cup, Jake O'Neil of Tucson, Arizona, continues to hold a 46-point advantage (693 to 647) over Johnny Scott of Las Cruces, New Mexico, while Woodward, Oklahoma's Dereck Ramirez is close behind with 638 markers. Lucas Schott of Chatfield, Minnesota (626); Zack VanderBeek of New Sharon, Iowa (603); Stormy Scott of Las Cruces (601); Terry Phillips of Springfield, Missouri (600); Rodney Sanders of Happy, Texas (587); Jake Timm of Winona, Minnesota (557); and Joe Duvall of Claremore, Oklahoma (475) round out the top ten. Johnny Scott remains atop the Summit USMTS Southern Series standings with a healthy 91-point advantage (686 to 595) over Ramirez. Sanders is third with 588 points, followed by Stormy Scott (550); Duvall (543); Carlos Ahumada Jr. of Canutillo, Texas (510); Logan Robertson of Shamrock, Texas (503); Cade Dillard of Robeline, Louisiana (464); Zane Ferrell of Hermitage, Arkansas (464); and VanderBeek (422) in the top ten. On Friday at the West Texas Raceway will see the pit gate swing open at 4 p.m. and the grandstands will open for seating at 5:30. Hot laps begin at 8 with the first green flag flying at 8:30. General admission is $20, kids ages 5-16 are $10. Pit passes are $35. Children 4 and under are admitted free of charge. Southern Sport Mods, Stock Cars, Street Stocks and Pure Stocks will also be in action. The track will host an open test 'n' tune on Thursday night, April 26, from 7-9 p.m. The pit gate opens at 5 with pit passes $20 and kids 4 and under free. Pit concessions will be open with a limited menu and West Texas Race Fuel will be open. The grandstands will be closed on Thursday. The West Texas Raceway is a 3/8-mile high-banked clay oval located south of Lubbock on US 87 to FM 1585, then east to Frontage Rd., then 0.3 mile north. For more information, call (806) 470-4388 or (406) 439-5086 or visit www.westtexasraceway.com online. The 9th Annual Production Jars Amarillo Ambush presented by MSD Performance takes place on Saturday at the Route 66 Motor Speedway with pits opening at 4:30 p.m. and grandstands open at 6. Hot laps start at 6:30 and the first heat race hits the track at 7 p.m.
General admission is $15, kids ages 4 and under get in for free and pit passes are $30. The four-division card will be rounded out by Street Stocks, Limited Late Models and Limited Modifieds. The Route 66 Motor Speedway is a 3/8-mile high-banked clay oval located 1.5 miles south of I-40 at exit 75 on Lakeside Dr. in Amarillo. For more information, call the track office at (806) 383-0375 or (806) 335-3478 for race day updates. The track's website is www.route66motorspeedway.com. The weekend wraps up Sunday when the stars and cars of the USMTS cross the Red River and return to the Enid Speedway in Enid, Okla., for the first time in more than a decade. The pit gate opens at 2 p.m. and grandstand tickets go on sale at 3. Grandstand gates open at 4 with hot laps at 5:45 and racing at 6:15. General admission grandstand tickets are $20 each while juniors (12-16), seniors (65+) and military get in for $15. Kids under 12 are admitted free of charge. Pit passes are $35 (5 and under $15). Sunday's show will also feature Limited Mods in action. The Enid Speedway is a high-banked 3/8-mile dirt oval 2.5 miles north of US 412 on US 81, then 0.5 mile east on W Oxford (at the Garfield County Fairgrounds). For more information, call (580) 554-2451 or visit www.enidspeedway.net online. For those unable to be there in person this week, every lap of every race in every division all three nights will be broadcast live on RacinDirt.com. USMTS OFFICIAL SPONSORS: Alpinestars, American Racer Racing Tires, Argo Manufacturing, Casey's General Stores, Chevrolet Performance, CP-Carrillo, Deatherage Opticians, Eibach Springs, Fast Shafts, Intercomp, Jerovetz Motorsports Racing Parts, KSE Racing Products, Leaf Racewear & Safety Equipment, Malvern Bank, Mesilla Valley Transportation, MSD Performance, Nitroquest Media, Pace Performance, RacinDirt.com, S&S Fishing & Rental, Summit Racing Equipment, VP Racing Fuels.